Spider-Man attempts to intercept a cruise ship whose passengers include a doctor who has developed a new vaccine which could cure his Aunt May’s illness. 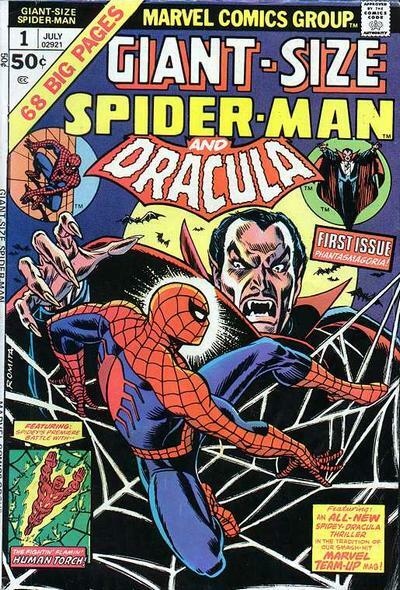 Unfortunately, Dracula seeks to destroy the vaccine for reasons of his own, and he and Spidey briefly cross paths. The Human Torch has a cameo. 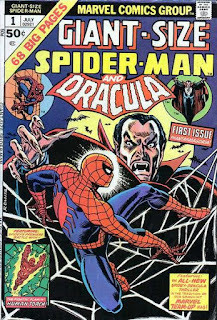 This version of Dracula is the same one seen in Marvel’s Tomb of Dracula series, which is largely compatible with Crossover Universe continuity. Since a version of Spider-Man is already in the CU through other crossovers, it is likely that this story occurred in the CU as well. The Human Torch and his teammates in the Fantastic Four have also already been included in the CU. Speaking of Dracula, I don't recall Win including Indiana Jones and the Cup of the Vampire. It has Indy meet a descendant of Dracula and Jones comes across what are supposed to be Dracula's bones in his old castle. Is this a candidate for inclusion in the CU? I think it could be included, though since it's a choose-your-own-adventure book we'd have to go with the outcome that's most favorable for Indy as the canon one for the CU. When I first saw this title, I misread it as Ship of Friends. I was wondering if it was a crossover between Friends and the Loveboat ;) Not really I saw the picture of Spiderman. You know I read a lot of those choose your own adventure books as a kid. I wish I had known there were Indian Jones ones. I imagine we could consider the other outcomes (than whatever you choose as best suited to the CU) as fictionalizations. Or maybe they will be alternate universes. I don't know.